Yesterday is my first time to convert dollar currency to Philippine Peso this year. I will start monitoring the Philippine Peso Dollar Exchange rate for the whole year since some of my extra earnings will be in dollar currency. According to the Bangko Sentral ng Pilipinas (BSP), exchange rates are determined on the basis of supply and demand in the foreign exchange market. The market-determination of the exchange rate is consistent with the Government’s commitment to market-oriented reforms and outward-looking strategies of achieving competitiveness through price stability and efficiency. 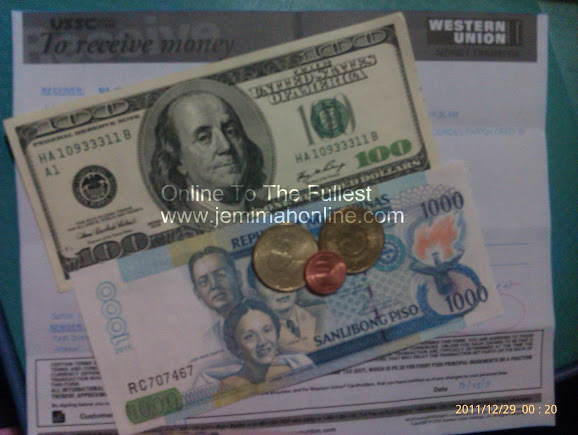 As of 1/4/2012, one dollar is equivalent to forty three and seventy five eighty ($1:PhP 43.7580). When I checked the Philippine Peso Dollar Exchange rate last 1/3/2012, it is $1:PhP43.9) which is higher compared today. At SM money changer, the exchange rate of the dollar-peso is $1-PhP43.35. A valid ID like SSS, Passport, etc. is required if you are going to use the SM money changer service. To know more of the other exchange rates, you may visit Bangko Sentral ng Pilipinas Exchange rate bulletin.